Woohoo! They extended this if you haven’t gotten it yet. 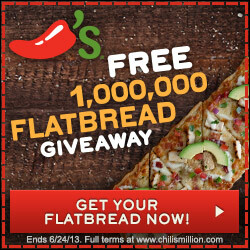 Click the banner above to visit the Chili’s site and join their email club. For doing so you’ll be able to score a coupon for a free flatbread. If you’re already a member, just answer their 3 questions and you’ll also be able to score the coupon. You can choose to redeem the coupon from either June 11-16 or June 17-24.